The WN3500RP is a product we've been interested in testing for an admittedly-selfish reason; we have dead spots of our own that we're itching to kill. Our router (also a dual-band Netgear solution) is positioned on the ground floor of our three-storey property, and the top floor is notoriously bad for Wi-Fi reception. If we're lucky enough to get a connection at all, it tends to be at a basic 6Mbps and offers limited bandwidth. On thing's for certain, the third-floor dead spot is long gone. A solid connection to an extended network is readily available in areas where the router would struggle to reach, and while every operating mode shows good performance, we see optimum results with FastLane Technology enabled and configured to connect to the router over 5GHz band. In this mode, we achieved a link rate of 216Mbps between extender and router, and a link rate of 144Mbps between extender and laptop, resulting in a healthy wireless download speed of 14Mbps. This is because the added latency of an extender - remember, your data's being subjected to an extra stop - will result in transmissions that are slower than that a direct-to-router connection. We've found the extended network to be plenty sufficient for streaming high-quality video from the web, but enthusiast gamers who live or die by their ping may not be satisfied. 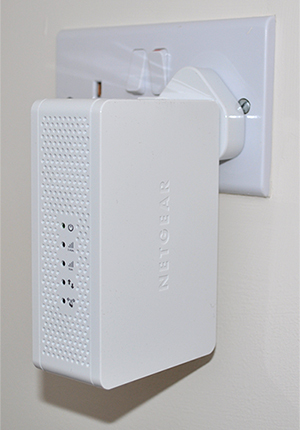 The Netgear Universal Dual Band WiFi Range Extender, Wall-plug Edition is one of those products that does exactly what it says on the tin. For anyone struggling with wireless range, the WN3500RP represents a solution that's both easy to use and quickly configurable. There are cheaper and smaller extenders on the market, but with Netgear's added extras - including dual-band support, AirPlay audio streaming and FastLane Technology - the WN3500RP is a well-rounded package that's more than up to the task. The Netgear Universal Dual Band WiFi Range Extender, Wall-plug Edition is available to purchase from PC World. looks good, good idea, shame its just a blatent airport express rip off…but if it works for routers other than apples own, it could be a good thing…. but the plug thing, its a copy … its even white!